The Seven Last Words are the seven last sentences, or phrases, or sayings, uttered by Jesus as he hung on the cross on Good Friday, at least as recorded in the Gospels. Forgiveness is the only way to reverse the irreversible flow of history. for they do not know what they are doing. People who hung on a cross were not meant to ask forgiveness for those who were killing them; they were jeered and sledged mercilessly, and they were expected to return jeer for jeer, sledge for sledge, until exhaustion took its toll. It was all part of the sport. But Jesus forgave, and history can and one day will be reversed. Teach us how to forgive, Lord. Teach the nations how to forgive, instead of seeking an eye for an eye. Amen. today you will be with me in Paradise. Tradition gave the penitent thief a name, did you know that? He is called ‘Dismas’. He said, ‘Jesus, remember me when you come into your kingdom’. Dismas is a great example of faith to us: Jesus was enthroned all right, but his ‘throne’ was a cross, the place of degradation and shame. This was his only kingdom. Can I see what Dismas saw? Can I see signs of Jesus’ kingdom as I look around the world today? How is it coming? Does it really come as the hungry are fed and the homeless are sheltered? Or is that wishful thinking? Lord, I believe—help my unbelief. Forgive me, Lord, and increase my faith. Amen. Then he said to the disciple, ‘She is your mother.’ From that time the disciple took her to live in his home. Woman, here is your son. Here are my mother and my brothers! Whoever does the will of God is my brother and sister and mother. Friends, Jesus names us, you and me, as his sisters and brothers. He has created a new community, a whole new family through his love poured out for us. Can we enter into these new friendships, these new kinship networks, that are created by his Spirit among us? Can we love one another, as he has loved us? God the Father did not save our Lord Jesus from Calvary, but the Father was there with our Lord throughout that whole ordeal. 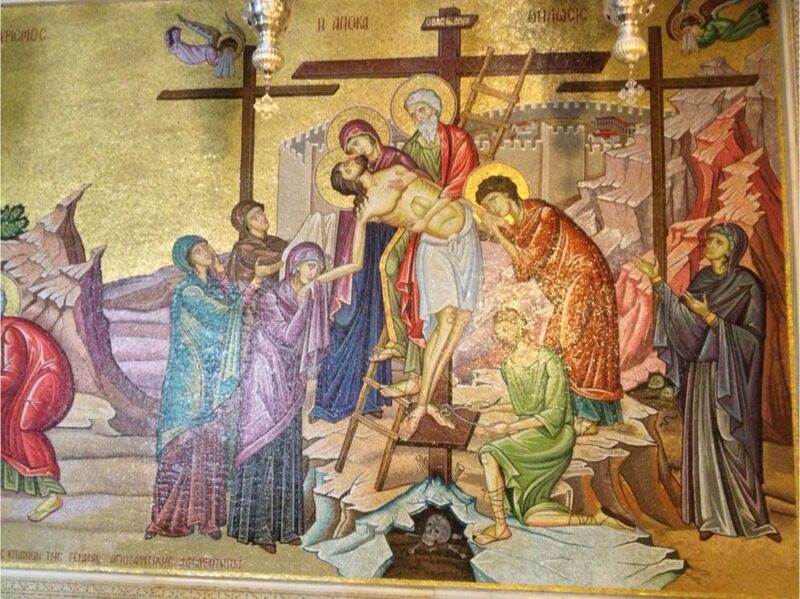 1700 years ago, Cyril of Jerusalem reminded us that it was right here Jesus that truly took our place on the cross. We know what it means to be separated from God, through sin or disobedience, though despair or unbelief, through grief and loss, through serious illness and as we face death. We are separated from God; Christ knew that separation in order to be one with us. Yet God was still there with him on the cross. My God—for you are still my God—why have you forsaken me? As he cries out, Christ is for ever with us who are lost, so that we may find our way home. Did Jesus get thirsty? Sometimes, we are strangely surprised when we realise that of course, the answer to this question is Yes. Jesus calls out, I thirst. Jesus calls out to us today, I thirst—where people have to walk miles to fetch water; or in places like Flint, Michigan where their drinking water is contaminated by lead. Jesus calls out to us today, I hunger—where drought or blight causes people to face famine. Jesus calls out to us today, I am homeless—yes, on the streets of Brisbane. Jesus, you thirst today. Give us hearts to quench your thirst. Amen. Your work was finished. You accomplished the mission the Father had given you in your life and your death. You now hand it on to us. You said we would do greater things; help us to trust you and your Spirit amongst us. Lord, strengthen us. Keep us faithful to you. Amen. It was about twelve o’clock when the sun stopped shining and darkness covered the whole country until three o’clock; and the curtain hanging in the Temple was torn in two. Jesus cried out in a loud voice, ‘Father! In your hands I place my spirit!’ He said this and died. for theirs is the kingdom of God. Deliver us from the ego-prison of our self-righteous spirits. Give us each one a renewed spirit, one we too may commend to your God and our God, to your Father and our Father. Amen. Pilate was there, trying to work out what to do to keep the crowd quiet. They say that politics is the art of the possible. Pilate merely looked for the way of least resistance. Barabbas was there, who had been arrested during an uprising. He was on death row, but that day he couldn’t believe his luck. They were letting him go and getting rid of someone else. Simon of Cyrene was there, a passer by from the place we call Libya, possibly a black man. He was made to carry Jesus’ cross; Jesus was too weak after his flogging. Other passers by taunted him, along with those who were crucified with him. Even the priests joined in. Jesus was the scum of the earth. Truly this man was God’s Son! And there were women there, standing at a distance. These were women including Mary Magdalene who had followed him and provided for him when he was in Galilee. There were other women too, who had come up with him to Jerusalem. The men had gone. Peter had denied him, Judas had betrayed him, the rest were in hiding. There is room for all of us there, even if we weren’t born at the right time to be ‘there’. We are there represented by the politically expedient, the onlooker dragged in, or by those who jeer and mock. Or perhaps we identify more with the women, who watched from a distance. Or the men, who were cowards or much worse. Maybe we see ourselves in the centurion, who saw the truth too late but could also begin to make sense of what he had seen. Were you there? Are you there? There’s room for you there because God is there. God is in the Saviour who died for you, and invites you to find in Jesus the love, the forgiveness, the grace and the peace of God. Let us sing: Were you there when they crucified my Lord? This time last year, some of us were in Israel, walking streets that Jesus walked and gaining new inspiration for our journeys of faith. I found one of the greatest places to be was the Church of the Holy Sepulchre in Jerusalem. It’s a sprawling place, with surprises around every corner. It’s one of the sites associated with the crucifixion of Jesus. Perhaps it really is where he was put to death, and buried; perhaps not. It was pretty crowded, and it was frustrating to navigate; so I think my report of the Church of the Holy Sepulchre might strike a note of disappointment if it wasn’t for one wall, a wall of mosaics. 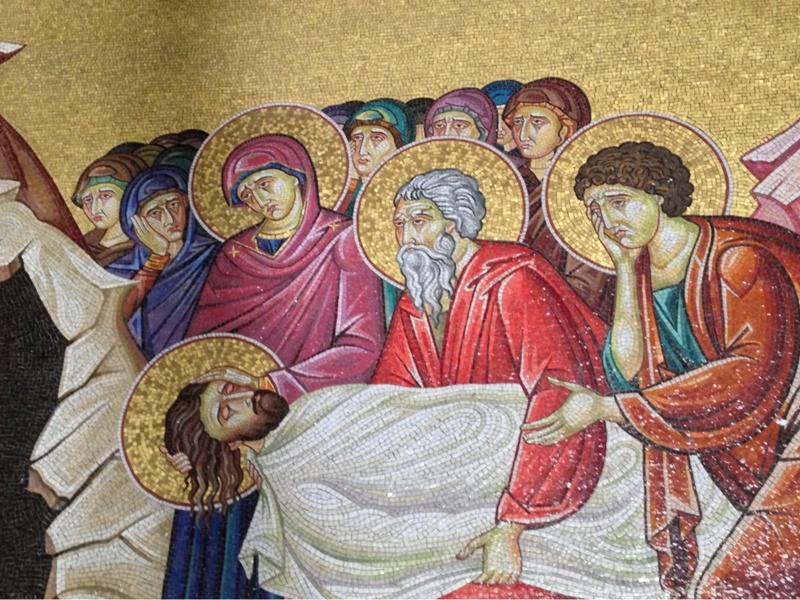 It is a more contemporary mosaic, which was placed by the Greek Orthodox Church. 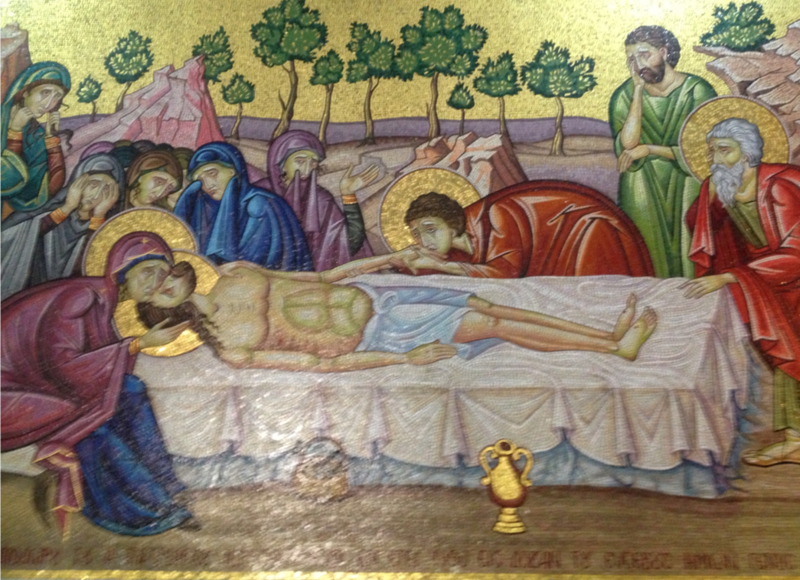 This scene depicts ‘The Deposition from the Cross’. 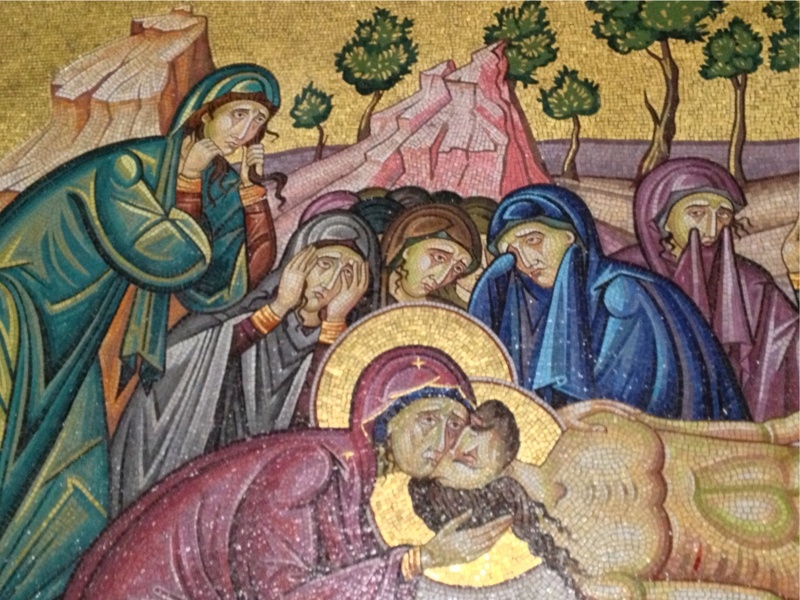 We have Mary the mother of the Lord and Joseph of Arimathea supporting Jesus’ body, Mary Magdalene and the Apostle John kissing his hands, and Nicodemus removing the nails while the other women stand, weeping. 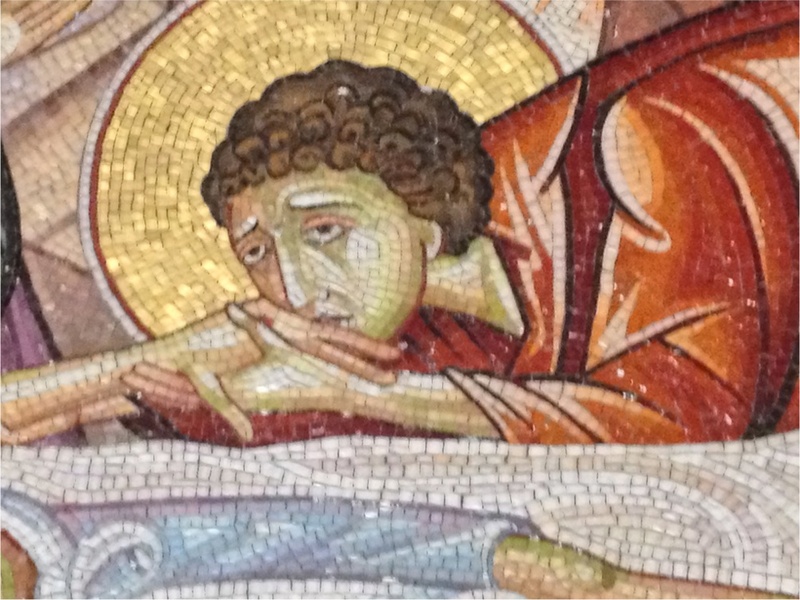 In the next part of the mosaic, Jesus’ body is laid out on the burial cloth ready to be shrouded. In the third and final scene, Jesus is being laid in the tomb. This is a stunningly beautiful mosaic. I stood before it in speechless wonder for a long time. Let me point out two things. The first is the sorrow. Just look at the faces. The sorrow of Holy Week is profound. The loss is absolute, and it is felt even by the powers of heaven. Jesus had healed the sick and brought sight to those who could not see. He was the promised Messiah. But they crucified him between two thieves. He was going to bring in the kingdom of God. But they crucified him on Golgotha, the Place of a Skull. Now everything was gone. It had seemed so wonderful at the beginning of the week, but now it seemed a strange dream. What were all the palms for, all the cheers and the crowds and the shouts of ‘Hosanna, Save us Lord!’? Save us? He couldn’t save himself. 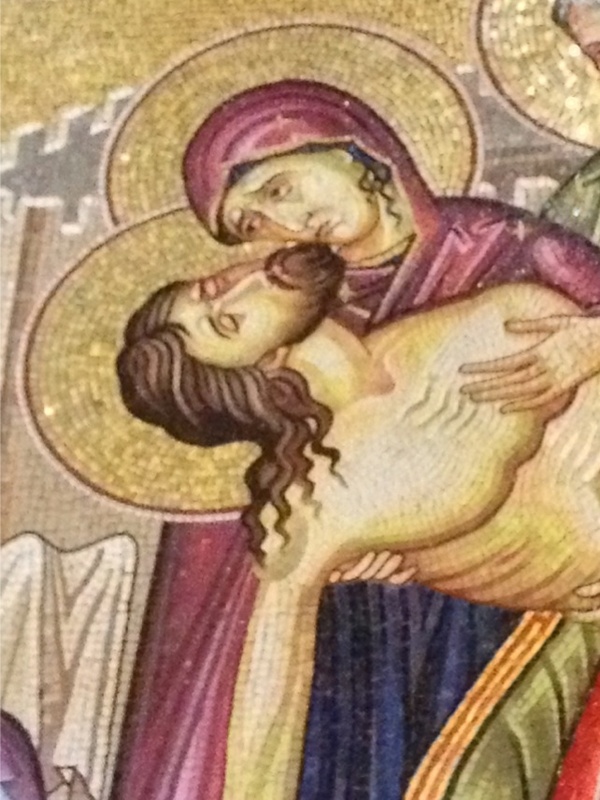 The sorrow of Holy Week is profound, and we shouldn’t try to downplay it. 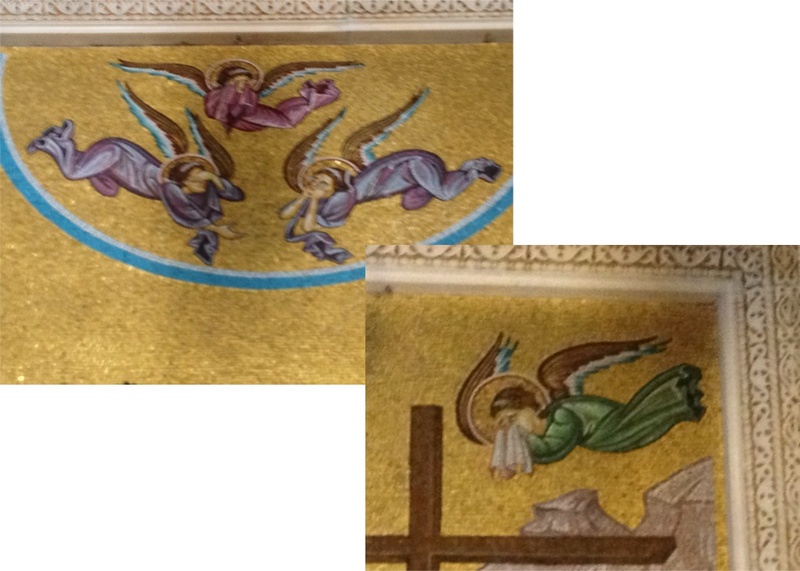 Remember I said I had two things to point out about this mosaic in the Church of the Holy Sepulchre? The deep sorrow is the first. The second is this: the vibrant colours. This mosaic is a complete riot of colour. There are reds, blues, greens, oranges, purples. Oh, and lots and lots of gold. Don’t you think it really should be more subdued? I mean, come on, this is a scene of unrelenting sorrow, of cosmic sorrow. But it’s ablaze with colour! It’s about Easter. We can imagine that as Mary the mother of Jesus, Mary Magdalene, John and the others took Jesus’s lifeless corpse from the cross and laid it in the tomb that there was no light for them. Everything was grey. Perhaps Mary wondered if the sun would ever rise again. Yet the dawn of Easter Day was just a few short hours away, it was just over the horizon. What we see in this mosaic is no created light. It is Easter light, the light of the resurrected One. We see utter and inconsolable sadness, while the light of Easter shines upon the people without their being aware of it. Some people speak of Lent as a time of ‘Bright Sadness’. Bright sadness. It’s a time of sadness, which we should not try to diminish or avoid. Christ went to the cross to save his people. He died to being us back to God. He died on our behalf. How can we minimise the death of God’s very Son? Well, we can try, by ignoring it, by commercialising Easter, by only going to Easter services if we feel like it. But we shouldn’t try to do that. And really, nothing we do or fail to do will ever truly minimise the horror of this week. But Lent, and above all Holy Week, is a bright time too. Over it the light of Easter shines. Salvation is ours. Our sadness is illuminated by the joy of Christ’s resurrection. Bright sadness is not optimism. It’s not about being a ‘glass half full’ kind of person. It’s not ‘looking on the bright side of life’, or ‘walking on the sunny side of the street’. Bright sadness is faith that the light of Easter shines in all situations. Bright sadness is faith that even death itself is not a full stop, but only a comma. Bright sadness doesn’t avoid the sadness! It means that at this time of year above all others, we recognise the great price our Saviour paid, we acknowledge our shortcomings and sins, and we lift our voices in grateful praise. And this time of year reminds us to live to God at every time of the year. This wall mural speaks to us of bright sadness. Can we embrace this bright sadness? We surely can, and we must. It is God’s gift to us, for the sake of Jesus our Lord and for the world that needs his peace, his justice and his reign as servant-Lord of all. Thank you for being in church today. I mean it! Thank you for being the church today, Good Friday, with the crucified Lord. We live in a word of pain—and also the avoidance of pain. Today, there is nowhere to hide from the painful reality that Jesus died on the cross, his body already broken by torture. The first thing: in the Cross, we see the eternal and infinite love of God for us. We didn’t see that coming. And the second thing: Jesus died as a criminal, but overcame death for us. Death is defeated, and he is risen for evermore! We didn’t see that coming, either. In the Cross, we see the eternal and infinite love of God for us. We couldn’t have expected that. The cross was a degrading instrument of death, used for the very worst criminals. People sometimes took days—agonising days—to die, but the torture Jesus received before his crucifixion considerably shortened his time on the cross. It was commonly understood that anyone who died on a cross was under God’s curse. Why else would they be there? That meant that Jesus must be under a divine curse. So you can see that the Cross was a genuine embarrassment to the early Christians; it’s not something they’d make up. Following a crucified criminal, calling this criminal ‘Lord’, was like being part of a lunatic cult. So why did the Christians not hide the details of Jesus’ death out of sheer shame? Why did they remember it? And why do we still remember it 2000 years later? We remember this man of out all the crucified victims for this one unexpected thing: he conquered death on the third day. Jesus rose from the tomb, with the scars still on his hands. And Jesus also showed the heart of God the Father. He forgave those who ran from him, those who denied him, even those who killed him. This is God’s heart for us. No one has ever seen God. It is God the only Son, who is close to the Father’s heart, who has made him known. It is God’s Son Jesus who has shown us what the heart of God is: the heart of God for us is mercy, grace, peace and forgiveness. But it’s not just for us—it’s for all people. No exceptions. That’s another thing we didn’t see coming. God is Christlike, and in God there is no unchristlikeness at all. In other words, though we can’t see God, we can truly know God through Jesus Christ. God is Christlike. Jesus Christ is the perfect image of God. So where is God when Jesus gives himself for us on the Cross? Sometimes, it seems people think that God is high above in heaven safe from it all. But that’s not the Christian teaching. We teach this: God is Christlike. God is there with Jesus. Suffering with him. Enduring the Cross with him. A picture is worth a thousand words. 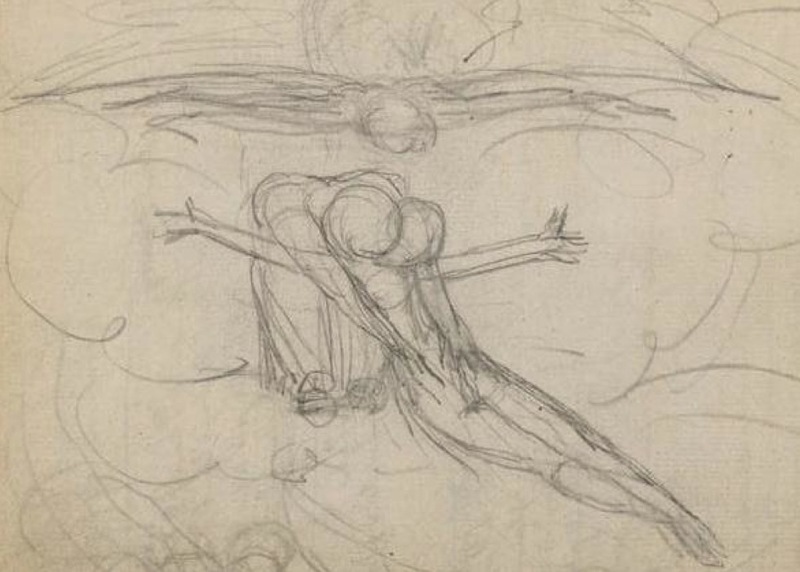 This sketch by William Blake shows the Father embracing the Son in his agony, and the Spirit hovering between them. Thank you again for being in church today. Thank you for staying with Jesus in his hour of need, and opening your heart to him. Keep your heart open to this loving, living Lord who perfectly shows us the forgiving and reconciling mercy of God. Amen. Why do we call this Friday ‘good’? Those lines are from Four Quartets, by T.S. Eliot. Why do we call it ‘Good’ Friday? What do you say when a child asks you if Jesus died today, why don’t we call it ‘Bad Friday’? We have quite a mixed attitude to the Cross of Jesus Christ. The physical torture of the cross was surely more than enough for Jesus to endure, but he also experienced the absence of God for the first time in his entire life. For him in those moments there was no vindication. No rescue. Just the sheer agony of godforsakenness. How can an instrument of sheer torture be ‘wondrous’? Are we mad? This is something like no other thing on earth. This is something that we have no comparison for. It stands alone. Why do we call this Friday ‘good’? Why do we remember this man who died on a cross above all others who died on crosses, and above every other victim of injustice, terror and political envy? Quite simply, we remember this man because God our Father raised him from the dead. His friends and followers were totally demoralised when Jesus was betrayed and arrested. Peter denied him, the others scattered. A few women looked on from afar. It was all over. Their world was shattered. Their hopes were gone. There could be a knock on their door at any time. They might be dragged away too. Nails could also be driven into their hands and their feet. God hadn’t just abandoned Jesus. God had abandoned them too. Before long, though, these same people were saying, ‘We have seen the Lord!’ And they were filled with a new energy and power that they recognised as God’s Holy Spirit. They had to grapple with what the cross meant. It could no longer only be an instrument of shame—we see sorrow there, yes, but also love. As they looked back, they saw that God had brought something supremely good out of an absolute horror. Jesus lives—Jesus forgives those who had left him in the lurch, and even his killers—and Jesus is alive in them. They began to see that death does not have the last word. The life of Jesus overwhelms death. Death is the second-last thing to happen; the last thing is resurrection to new life in God with Jesus Christ. They saw that Jesus died for them, and they were transformed. That same transformation is there for us today. We too can know the life of Jesus within. We can know too that the deepest, darkest losses and disappointments of life are never the last thing. The last thing is resurrection to new life in God with Jesus Christ. Easter Sunday isn’t a postscript to an ugly death. It isn’t a happy ever after ending. It’s a new beginning, a second chance at a new life. Don’t hang back from the Crucified One—he is risen! Our community has mourned lately, and we’ve seen grief. We’ve mourned the damage done by the floods, and we see people continuing to grieve at the slowness of action to help them repair their homes. We’ve seen people mourning because of the damage done by Cyclone Yasi, in Christchurch and in Japan. Yet Aussies are still not all that attuned to mourning. We seem to see it simply as a problem to be solved. We expect to be able to fix things up, or replace them. We want to keep moving forward. A widow went to her doctor. She said she’d been told by her friends she was grieving too much for her late husband, and that she should be getting over it. The GP asked how long since he had died…her reply was Six weeks ago. He was barely cold, and her friends wanted her to ‘move on’. to transform neurotic misery into common unhappiness. Now that’s a promise even a pessimist could trust! You can be happy all the time!! Your life will be wonderful every day!!! Just come to our church, accept what we say, and put your money in the plate! To be ‘comforted’ in a future time seems a little anaemic really. Yet it is Jesus’ promise to those who mourn. We shall be comforted. And this is the kind of world we live in, a world of hope and a world of promise, grounded in God’s word. The comfort may come in the future, or in the next life, but it is assured. ONE OF THE traditional ways of presenting the death of Jesus is to describe it as a sacrifice. That is problematical for many people in contemporary society. The church’s great theologians through the centuries proposed various theories to explain how the death of Jesus saves us. Some of these old theories survive today and are still used to test a person’s orthodoxy. For myself, I find those old atonement theories brave in trying to explain the mystery of the cross. But I find none of them completely satisfying. The fault in most of them is that they drive a wedge between God and Jesus. They make it sound as if a ruthless God had to be bought off by the sacrificial death of Jesus. As if God made the demand that “someone’s got to pay for the sins of the world”. Any wedge between God and Jesus does not help my understanding, nor is it faithful to the whole witness of Scripture. So what are we left with? We are left with Jesus on the cross. We are left with a man in whom God was fully present, dying as a result of our shared human evil and the feral ways that flow from our alienation from the Creator of life. On the cross, I believe that God is fully present in Jesus Christ to the bitter end. On the cross I see God in a man who experiences not only physical agony but spiritual desolation. Therefore I am left with a God who will die for us. A God who, in loving us, will bridge the gulf of alienation at all cost. After many decades of faith, and professional theological study, I still do not understand the “mechanics” of God “reconciling the world to himself”. I have no neat theory to replace the old ones, though people like Jürgen Moltmann, James Allison and other contemporary theologians are attempting new “theories of the atonement”. At the cross I am forced to live with a wonder I cannot explain. Many of our old hymns have atonement theories that less than adequate. However Brian Wren’s graphic hymn, ‘Here hangs a man discarded’ (Together in Song 356) is worth contemplating. And suffer with us there. God with us and for us. A gulf bridged, a world saved. I cannot comprehend it or explain it, but I dare to believe that much.